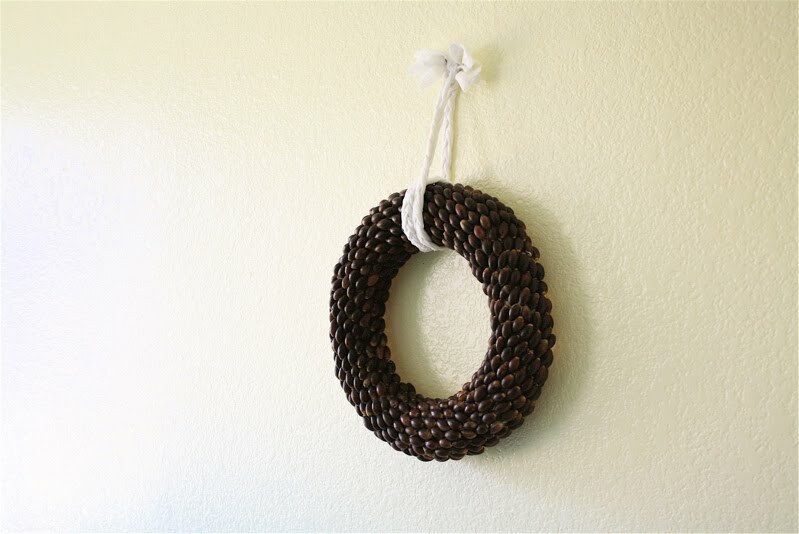 Crafting on a Budget: DIY: Acorn Wreath in Any Color! 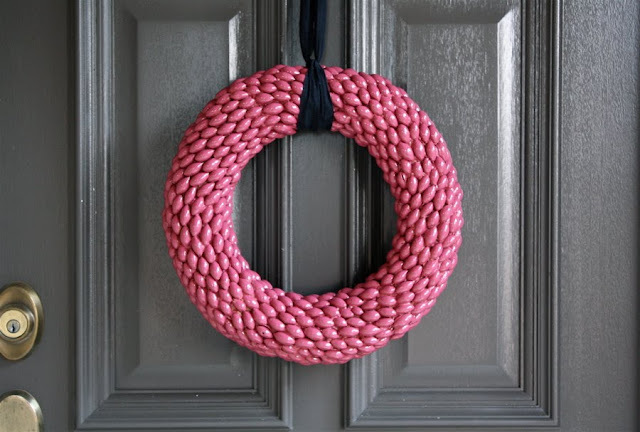 Made has a tutorial that is completely customizable to your taste and home decor! This seems like it may be a little time consuming, but we bet that if you get a few friends together and perhaps have a coffee or a glass of wine together, this will be together in a jiff! Sewing is a love to me. In fact, it may be addiction. But crafting is a new-found interest. Until we moved into a house two months ago, I had kept the crafts at a minimum. Our old 2-bedroom apartment felt like piles of projects were caving in on me. The last thing I needed was more decor. 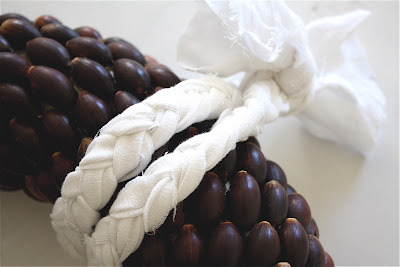 But now that I have bare walls that can breathe, I’m exploring all those wonderful craft projects I’ve admired from afar in the blogging world. And this one caught my eye. I love the simplicity of it and monochromatic color. 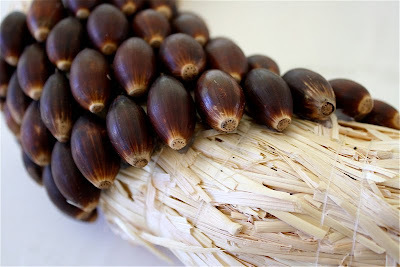 And better yet, it was made from acorns!….something the kids and I see everywhere at the park. So last week, with empty bread bags (from feeding the ducks) the kids and I loaded our bags as full as we could with brown acorns. I felt like one of my toddlers, gathering treasures, slightly giddy with craft excitement. And I loved that we were working on a project together. Though my acorns are not as cool looking as hers, I hope you enjoy my acorn wreath adventure. Let’s get started! 1. Gather acorns. If you can find the ones with the little hats on top, totally cool. I just had these to work with. But in the end I still liked the result. 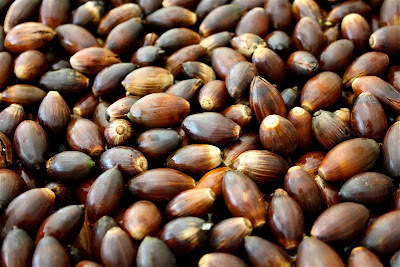 If you don’t have acorns in your area, you might try what the woman in the above link did. She posted on her blog, asking readers to send her some and four boxes showed up on her doorstep! What an amazing network this blogging place is. 2. Clean and BAKE your acorns. Oh my, this is an important step. 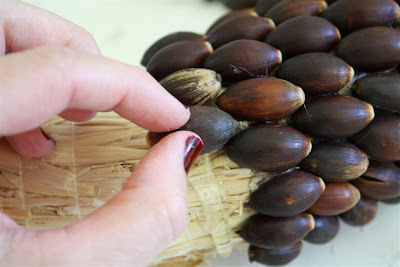 At first we brought the acorns home and since they had been outside, I washed them and just laid them on a towel to dry. Then I read the post above in thorough detail. 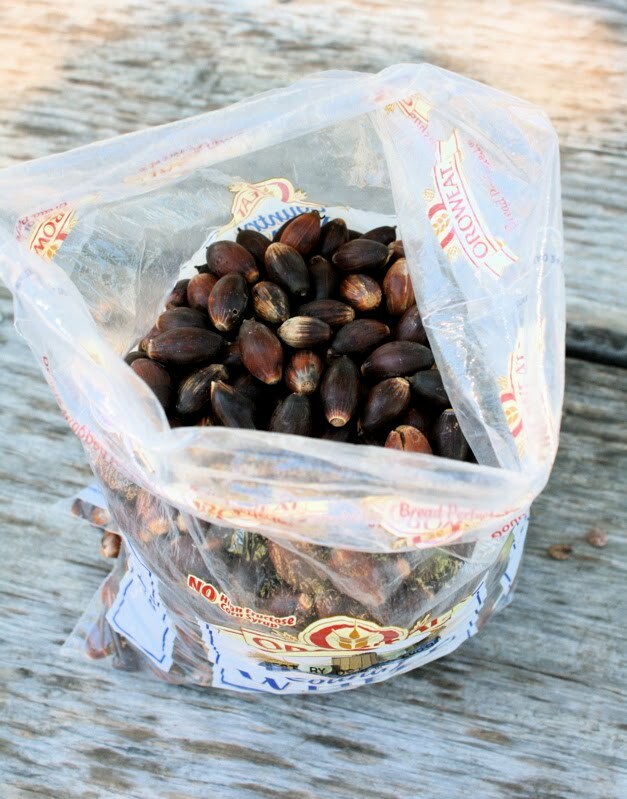 And when I got to the part about her dormant box of acorns festering with little maggots, I freaked out and threw my acorns in the oven for 15 min at 350 degrees to make sure any little creatures living within had croaked. (for more info read here). 3. Gather a wreath and glue gun. 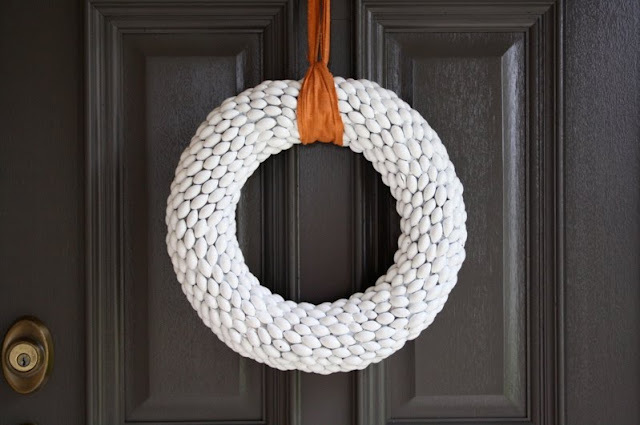 I purchased one of these very inexpensive straw wreaths (only because we were at the end of our budget for the month and I was trying to be a responsible wife). You can also use floral or wooden wreaths. 4. Start glue-ing! I chose to do mine in a diagonal wrap-around pattern. 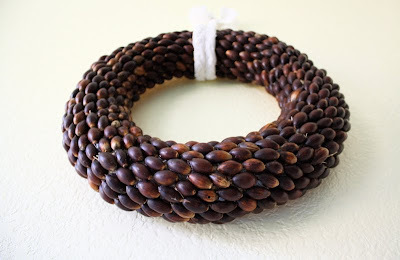 So first I drew one line with a marker around the wreath, put some hot glue on that line and laid the acorns on top. 5. 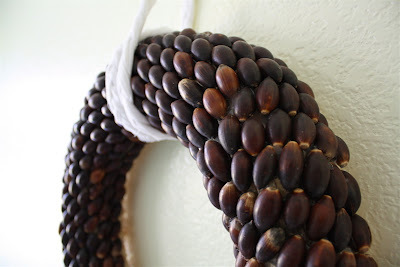 Glue acorns all around the wreath (But don’t bother glueing them on the back. No one will see it and it will lay flatter on your wall or door. ) 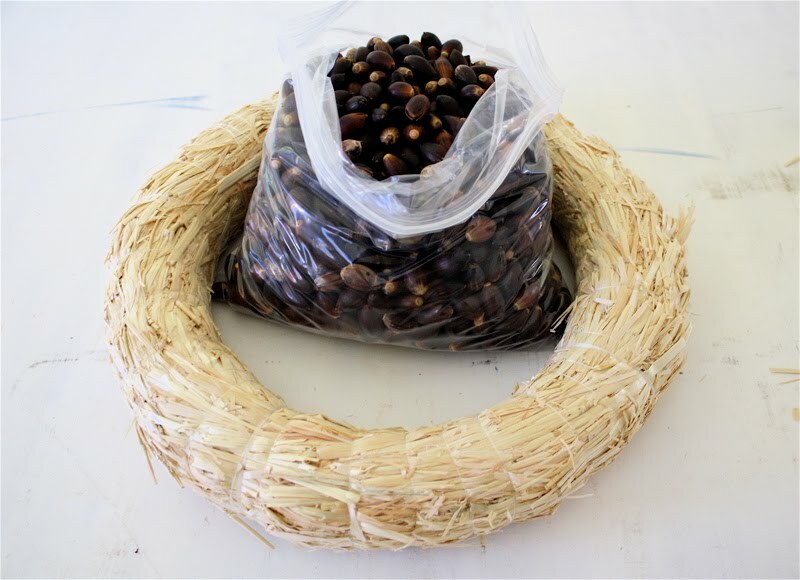 As you go around the wreath, it may be hard to keep each line curving with the same degree as the previous one. I continually adjusted here and there as I went. 6. Add a ribbon, admire your (tedious but exciting) work, and hang it up. Of course, if you’re anything like me, it’s hard to decide which color you like best. So, I spray painted it white. And I love this version even better. Jordan Almonds anyone? 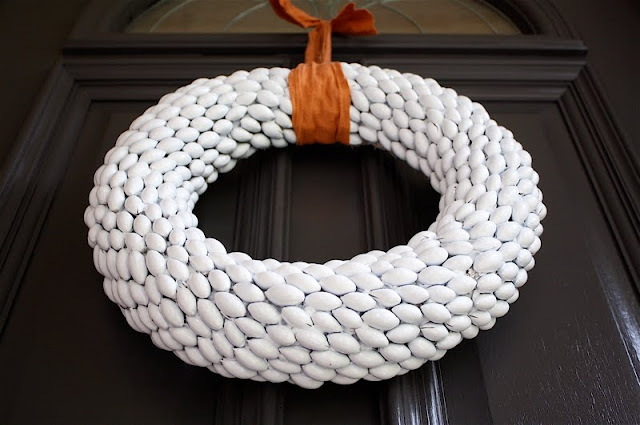 Next to the charcoal gray door, white adds perfect contrast. And it works for most seasons! 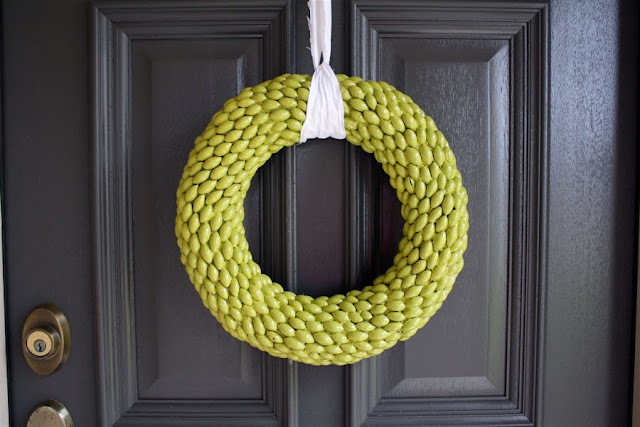 When Thanksgiving is over, tie a red, green, or gold ribbon on there. Or better yet, paint it green!